The scientific name for a bald eagle is Haliaeetus leucocephalus. A bald eagle is classified as a Sea or Fish Eagle and it generally preys on fish although it will also prey on small mammals if it is easy to catch or is already dead. A bald eagle really exerts itself during hunting and therefore requires plenty of rest afterwards. This bald eagle was resting after a nearby feeding frenzy. 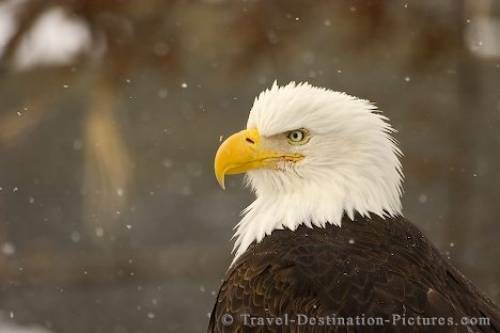 Photo of a majestic Bald Eagle during light snow fall in Homer, Alaska, USA.